How to Install Dual Brake Calipers ? Front brakes on all modern cars are disc brakes. The front brakes generally provide 80% of the stopping power, and so tend to wear faster than the rear. Replacing them — pads, rotors and calipers — is quite simple once you understand the process, and can save you a great deal of money. These instructions will include a full front brake replacement. Also, having a service manual for your vehicle will save your sanity, as well as time and money. If you only need pads, or pads and rotors, but not calipers, skip the steps for replacing calipers. Repeat the steps below for each side of the car as necessary. The work will go even smoother if you ask a competent friend to help you — especially the first time you do this kind of work. If the front brakes have been squealing loudly, you may need pads only. If the car or brake pedal has been shaking when braking, you’ll need to have the rotors resurfaced (called “turning”), or replace them. If the car pulls to one side while braking, but stays straight otherwise, you may need calipers. This is a sign of uneven wear of your brake pads caused by uneven pressure in your brake lines. If the brakes have a grinding noise, this means rotors are done, spent, wasted, or whatever you want to call it, just replace them. Determine the parts and tools you’ll need. There are two bolts that hold the caliper to the pad bracket, and two bolts that hold the pad bracket to the steering knuckle. You may need both SAE and Metric sizes of wrenches and sockets, as well as bleeder screw wrenches. Also, you may need a set of hex (ALLEN) or star (TORX) key wrenches or a hex or star bit socket set. Consider using line wrenches to remove calipers. Theses wrenches have a better bite and reduce the chances of rounding off hex nuts fitting on the hose end. Buy more parts than you think you’ll need. You can always return what you don’t use (keep your receipt and boxes and parts clean/undamaged). If you get caught without something while the car is apart, you may not have transportation to go buy anything. We all want to show appreciation for our Dads and a great way to do that is to give him a gift that will enhance his physical and mental well being. Auotbahn88 bonnet damper enables easier effortless opening and closing of your bonnet. 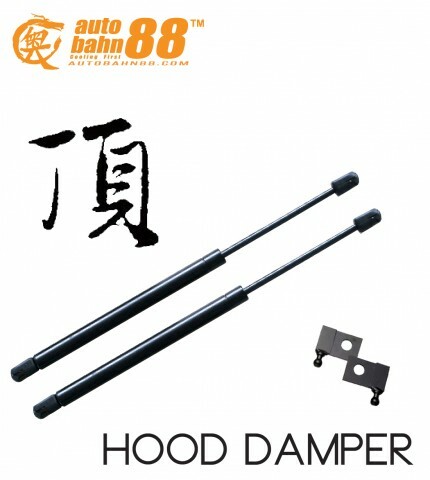 Hood damper is designed to be lightweight and compact, so that it does not get in the way of any works around the engine bay. As the main body of the damper only weights 600g and the extension that adjust the full-open angle of the hood is made of iron, the product is amazingly lightweight even with all parts/components attached. Hoods are usually made of steel. The bigger the vehicle is, the heavier the hood is. Opening and closing the hood can be extremely troublesome, especially in a case of emergency for people who does not do work on his/her vehicle on regular basis. Many people want to open / close the hood much more lightly and easily. To meet such demands, Autobahn88 has developed Hood damper. 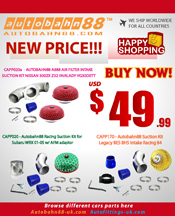 AUTOBAHN88 Bonnet Damper is your wise choice !!! At Gex Performance,we have a huge variety of hood dampers to ensure that you have every hood strut option available to you. We go out of our way to carry every major line of hood dampers, so that whether you are looking for hood dampers or a set of NRG hood lift struts or anything in between, we’ve got it for you. Gex Performance is the ultimate shopping destination for your hood strut needs. Our Bonnet Damper is your wise choice !!! We’ll be offering special deals on a regular basis so check back often to see what we have in store for you. Each deal only lasts for a limited time! Just open your bonnet and the high pressure gas struts will hold you bonnet up, no need to fiddle around proping your bonnet up with the old bonnet arm. These are very easy to fit, just bolts onto your origional fittings on your bonnet and wing. “No Drilling or cutting” just a socket / spanner 15~20 minutes to install. 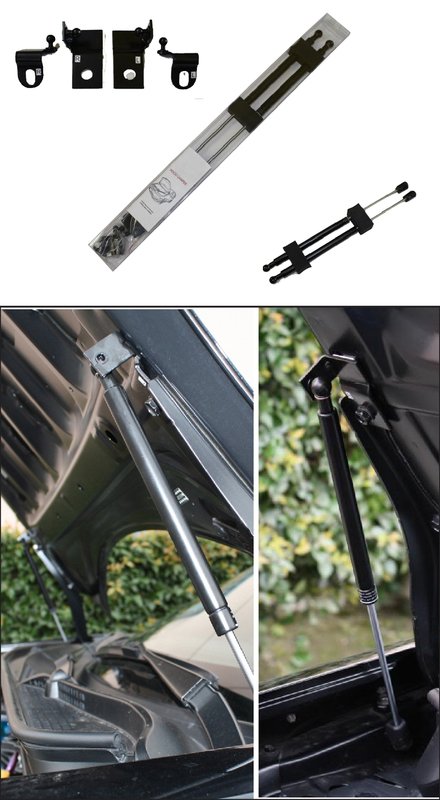 This damper kit is designed to be installed without any modifications to your vehicle, no more dirty fingers or frustration with holding your bonnet up and trying to locate the hole for the old bonnet arm. 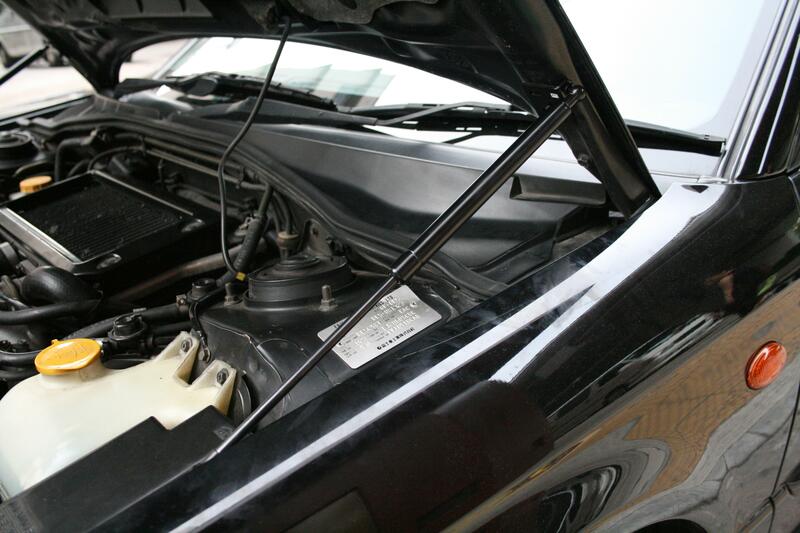 Hood dampers use the same technology as many shock absorbers. These gas filled struts can hold open a substantial load, and then telescope closed when needed. 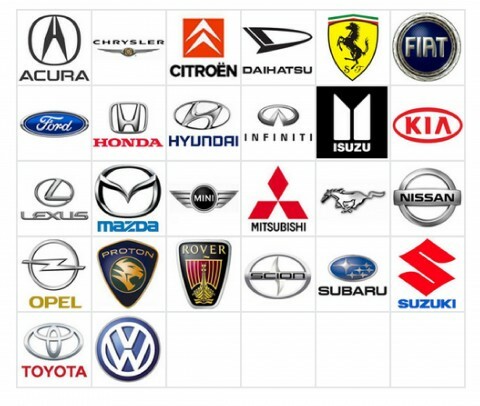 While many new cars come with hood dampers, they tend to wear out over time requiring replacement. Older vehicles on the other hand can be updated with hood dampers to make engine work a breeze. In addition to OEM style dampers, there are also several companies who produce custom hood dampers so that you can add a little flash to your engine bay and retain great function. This is the perfect modification for the budget minded enthusiasts who wants to improve functionality. 10, 9, 8, 7, 6, 5, 4, 3, 2, 1 …..
We are very excited to have finally launched our new site after months of development. You’ll see things are looking pretty spiffy around here as well as in the practice that is undergoing its own makeover. 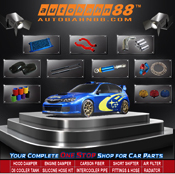 You can even buy car part online now from our website or from your own smartphone! Make sure you visit regularly for our latest news or why not LIKE us on Facebook to stay in touch! ( Search for gex performance on Facebook). And being our member now!! Autobahn88 Bonnet Damper is your wise choice! !